Welcome to the second part of my recap/tournament report about Grand Prix New York! You can find the first part here. Before diving into the Grand Prix itself, let me share a related observation about the costs of a three-day weekend. When I judge three days of a Grand Prix, I prefer to avoid having an explicit leadership role on all three days. In my experience, having a leadership role on that third day incurs a much larger incremental cost than the second day of leadership. While I’ll happily perform lead roles each day when there’s a reason for it, it’s not my default preference. Happily, Grand Prix New York worked out fantastically in that regard. On Friday I was simply part of the sides team, which gave me some time to warm up after a 2-month hiatus from judging events (and, as it turned out, recover from being ill). On Saturday, I was the team lead for one of the two deck checks teams on the main event; on Sunday, I was Head Judge of the Super Sunday Series. With the stage set, let’s talk about Saturday! I was overjoyed to work with Eliana Rabinowitz , Mani Cavalieri , Vincent Roscioli , and Eli Meyer for this event. Rather than going through things round-by-round, I’m going to focus on some of the bigger ideas about how the event was organized and what I learned about my own leadership style. Ready? OK, here we go! On Saturday, I showed up bright and early at 8am met with…half of my team. Wait, what? One of the recurring issues of organizing a Grand Prix is how to handle the “shift problem.” As GP staffs have gotten larger, splitting the main event judges into two (or more) shifts has become commonplace. Although invaluable for reducing judges’ workload, a shift changeover introduces other problems, particularly when it comes to transferring knowledge from the early shift to the late shift. GP New York tried to solve the shift problem in an interesting way…by not really having shifts. More precisely, judges could work either a regular shift or an extended shift. The extended shift showed up at 8am and stayed until the end of the tournament. The regular shift, meanwhile, was reduced on both ends; they arrived at 8:45am and worked until the end of Round 8. In particular, all the team leads at GP NY were on the extended shift. A typical early shift/late shift structure means that roughly half of your leadership leaves all at once, resulting in (frequently) very large pivots at that departure time. In contrast, GP NY’s structure meant that teams only had to adjust very slightly, as transitioning tasks from one or two people is actually pretty easy. Ultimately, I think the regular shift/extended shift setup did a great job addressing the knowledge gaps that typically result from switching over from the early shift to the late shift. However, it did so at the cost of knowledge in another area, or more specifically, at the cost of another group of people: the regular shift. By the time the regular-shift judges arrived at 8:45am, preparations for the player’s meeting was already well underway, and many teams were actively working on various tasks. At least for me, this made it more challenging than normal to get my team members on the same page and integrate everyone into a single unit. Overall, though, I was pretty happy with the extended shift setup. One way to address the team integration issue I mentioned would be having all judges (regular and extended shift alike) arrive at the same time. Of course, this would have to be counteracted by having the regular shift leave earlier (perhaps right after Round 8 has begun? ), which I think could be acceptable. The second big picture idea I encountered at GP NY is the challenge of co-leads. Almost every team at GP NY was duplicated (in part, I think, to account for the lack of split shifts, and also to easily enable full-team breaks). Co-leadership opens the door to a variety of issues, from the abstract (e.g. contradictory visions for the team’s role) to the very real (e.g. conflicting instructions on how to complete a task, one team thinking/assuming that the other team will take care of something). These problems can be amplified when each of the co-teams is trying to accomplish the same objective, and there isn’t actually enough work to go around. Fortunately, I feel that Deck Checks is a team that’s very amenable to co-leadership, in large part because Deck Checks is a very large task that’s easily divisible into concrete chunks. (You take this part of the alphabet, you take that one; you two deck check this table, you two deck check that table.) Given that, success basically comes down to ensuring the two co-leads are in sync with each other, rather than stepping on each other’s toes. Happily, my co-lead / partner-in-crime was Nicola diPasquale, a Northeast judge whom I’ve worked with significantly, so this part was easy. Frankly, I regard myself as an excellent communicator, so it was wonderfully eye-opening to receive this feedback. Reflecting further, I believe I’ve realized which elements of my communication led to these issues. Specifically, I skew towards focusing on high-level ideas and avoiding micromanagement. Moreover, I tend to trust (assume) that my team members have similar knowledge and experience to me and to each other, which doesn’t really make sense. The last topic I’d like to mention is related to team-building. At SCG Providence last year, I tried a “mini-Exemplar” exercise where I asked every judge on staff to sign their SCG “Judge!” token and give it away to a judge who made their event better. After I got my hands on a stack of blank inserts on Friday, I realized I could do something similar for Saturday. This exercise also motivated me to be attentive to the great things my team members were doing individually. 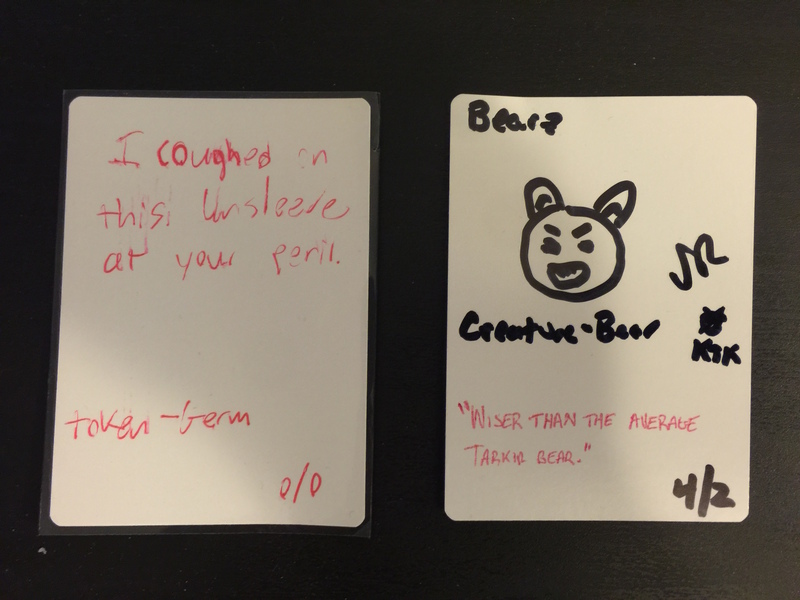 I ended up personalizing a token for everyone on the team (I made “Tribal Artifact – Bearz Clue” tokens), and I called out a specific thing each person on the team had done well as I gave them their token. I thought this exercise went very well, and I definitely plan on doing it again; the only thing I might do differently is introduce the concept earlier in the day. Saturday was an incredibly busy and interesting day, so I feel like I could go on and on about the various and sundry other issues we encountered. (Lack of a designated deck check space! Sleep-in special decklist woes! Transparent card sleeves! Pulling Day 2 lists!) But exhaustively categorizing what happened on Saturday was never the purpose of this post. Instead I wanted to focus on a few interesting ideas and problems that have broad applicability to future Grand Prix and other events. I hope I’ve gotten your problem-solving juices flowing. Check back soon for more stories and big ideas from the grand finale to my GP New York weekend: the Super Sunday Series! Click here for the third and final part of my Grand Prix New York experience!